The protagonist of the new NBC sitcom Champions is Vince. The washed-up high school baseball star gives up his dreams to take over the family gym in Brooklyn with his younger brother Matthew (Andy Favreau). During the show, Vince is told he’s the father of 15-year-old Michael (J.J. Totah). The teen wears jackets and ties and is more interested in musical theater than in building muscles and taking the playing field. 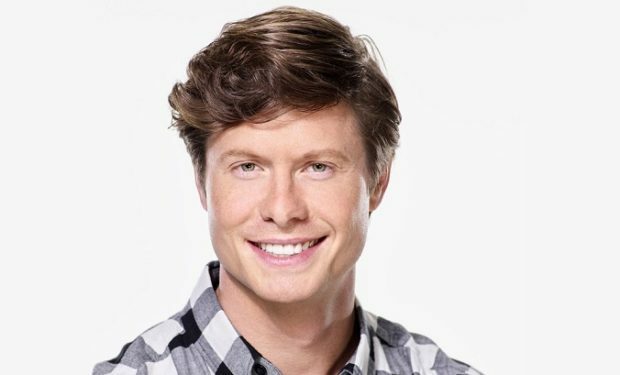 Dad Vince is portrayed by Anders Holm. As an actor Holm is known for his roles on The Mindy Project* (Casey Peerson), Workaholics (Anders Holmvik), and Crossbows & Mustaches (Bruce Romaine), among others. Holm is also recognized for his roles in the films How to Be Single (Tom), The Intern (Matt), The Interview (Jake), and Sausage Party (Troy), among others. Champions airs Thursdays at 9:30pm on NBC, right after Will & Grace, and right before Chicago Fire. You can see Holm next on the big screen in Game Over, Man! (see trailer below). *Mindy Kaling is the co-creator of Champions.